According to Arizona Sports, Arizona Cardinals defensive lineman Robert Nkemdiche went down with a strained calf in Tuesday’s practice and is expected to miss two to three weeks, making his status for the regular season opener against Detroit unknown. Nkemdiche was the Cardinals 2016 first-round pick. Nkemdiche’s rookie season was cut short due to injury. He saw the field for just 82 defensive snaps. On those 82 snaps, he produced two quarterback pressures and 0 stops while earning an overall grade of 48.7. 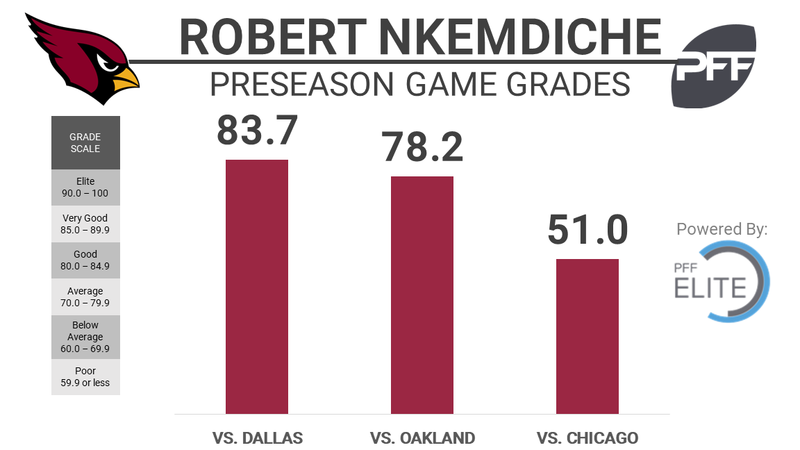 Through three preseason games of far Nkemdiche has been solid in two of them. Against Dallas he played 23 total snaps and earned an 83.7 overall grade. Against the Raiders in preseason Week 2 he earned an overall grade of 78.2 on 24 snaps and against the Bears he earned an overall grade of 51.0 on 26 snaps.